The main platform of the Apex Site, along with a Spirit dropship. The Apex Site was a Forerunner installation that contained a fleet of many Sojourner-class dreadnoughts inside the shield world Etran Harborage. The ships were left inactive for hundreds of millennia after the Forerunner-Flood war, docked in massive towers surrounding a hovering central platform high above the interior surface of the shield world. The Forerunner dreadnoughts being contained within the Apex Site. The Apex Site consisted of a narrow main platform hovering high above the inner surface of the Etran Harborage, and numerous docking towers housing a fleet of Forerunner Sojourner-class dreadnoughts. It housed a translocation pad which also served the purpose of a containment field device. The system was operated by vocal commands. The main platform was accessible from the Apex Base Site, a structure on top of a towering hill comprised of a series of ramps, containing a transporter pad that teleported anything stepping into it to the Apex itself. It was located on the inner surface of the shield world, most likely somewhere under the Apex Site. One end of the platform contained a spherical activation console covered in Forerunner glyphs. The console could only be operated by a Reclaimer, and when activated, would unlock the dormant Forerunner ships. When the installation was activated, a beam emitter behind the activation console would emit a continuous stream of energy directly upwards, an effect similar to many Forerunner facilities such as control rooms. On the other end of the platform, there was an elevator which lead right into the shield world's artificial star. Because of this, the lift obviously had to be shielded against the extreme heat. On the way to the star, there was an "access point", the nature of which is unknown, but it was likely a type of energy barrier, as it would need to be "broken through" in order to access the star. Sergeant Forge and the Red Team at the Apex Site, preparing to destroy the Shield World. In 2531, the Apex Site was the site of a major engagement between Spartan Red Team and Covenant forces lead by the Arbiter, who were attempting to prevent the UNSC from destroying the Shield World and the recently activated Forerunner ships at dock there. The Covenant, who discovered that they could use a human to activate the installation, captured Ellen Anders and brought her to the site. The Arbiter used her to activate the system, but she managed to escape the control center using the platform's translocation device. After regrouping and coming up with a plan to stop the Covenant from using the Forerunner dreadnoughts, the UNSC forces established a base and assaulted the Apex Base Site. After reaching the top, they teleported the UNSC Spirit of Fire's slipspace drive to the main platform of the installation, where they confronted several Sangheili and the Arbiter Ripa 'Moramee. After the repulsing of the Covenant assault and the death of the Arbiter in battle, Sgt. John Forge ascended up to the center of the Shield World and overloaded the FTL drive, causing the star to go supernova and obliterating the installation. The activation console of the Apex facility is similar to that of the Relic on Harvest. Similar installations with docking towers for Sojourner-class dreadnoughts are apparently common on various Forerunner military installations, as shown in Origins. In case the fleet was mobilized, at least one of the docking towers would apparently be detachable, and used in space combat as a flagship with the two ships still attached to it. Concept art of the Apex's dreadnoughts. Concept art of the Apex Site's docking towers. A concept image of the control platform. The ramps leading up to the Apex Base Site. The Apex Base Site teleporter. Activation of the Apex Site. A Forerunner dreadnought powering up. Ellen Anders being held in the containment field device of the Apex. The Apex Site's activation console. Docking towers similar to those of the Apex, surrounding a Library on an unknown Forerunner world. Renders of the Apex Site. ↑ Halo Wars, cutscene "Walk in the Park"
↑ Halo Wars, cutscene "I Doomed Humanity"
↑ 3.0 3.1 Halo Wars, cutscene "Monsters"
↑ Halo Wars, cutscene "Judgment Day"
↑ Halo Wars, campaign level, Escape, John Forge: "I'm in the sun." 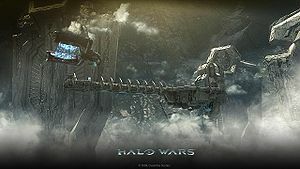 ↑ Halo Wars, campaign level, Escape, John Forge: "Forge here. I'm at the access point to the sun. I'll need some time to break through."